I get a certain amount of flak for my untidy veggie garden. I let things go to flower and seed and see what comes up from them next year. I love that I can grow carrots without having to do anything at all but throw around a bit of compost. That’s where I learned my new favourite word. It’s a mumbling, ominous-sounding adjective that doesn’t really suggest the prettiness and regularity of an umbrella shaped flower. I was astonished by the size and profligacy of the parsnip flowers. Carrots also seem to produce far more above ground than they do below. I started with one row of seed, and only three resulting plants. I let two go to seed themselves and they went on growing for three years, producing weird fibrous roots and massive flower heads. I’ve tried seeding in new places in the garden since, but the original area and its progeny makes the best and most prolific carrots by far. 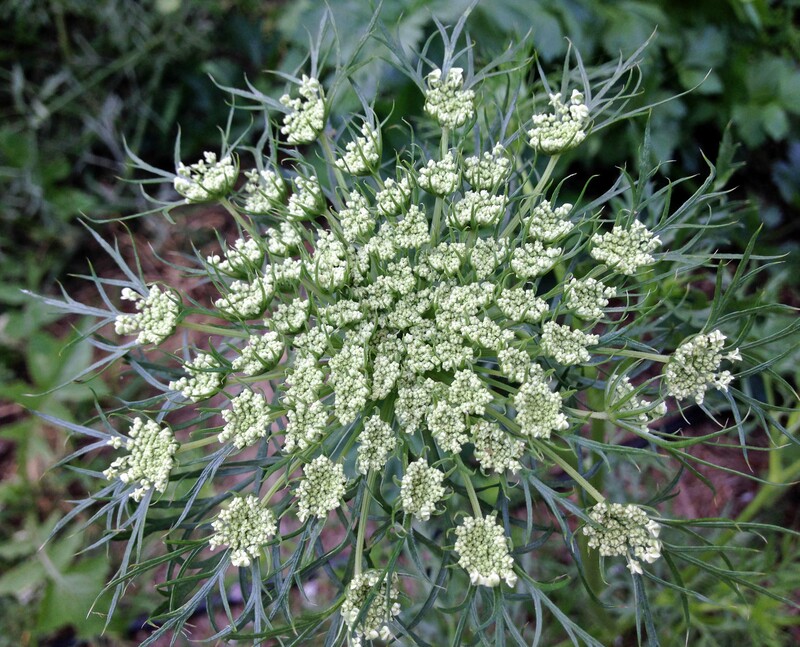 Most of my garden umbrellas are introduced herbs and vegetables, but there are some Australian natives in the umbel (“Apiaceae”) family including the local wildflower Blue Devil and something called “sea-celery” (apium prostratum) which doesn’t grow around here for obvious reasons. 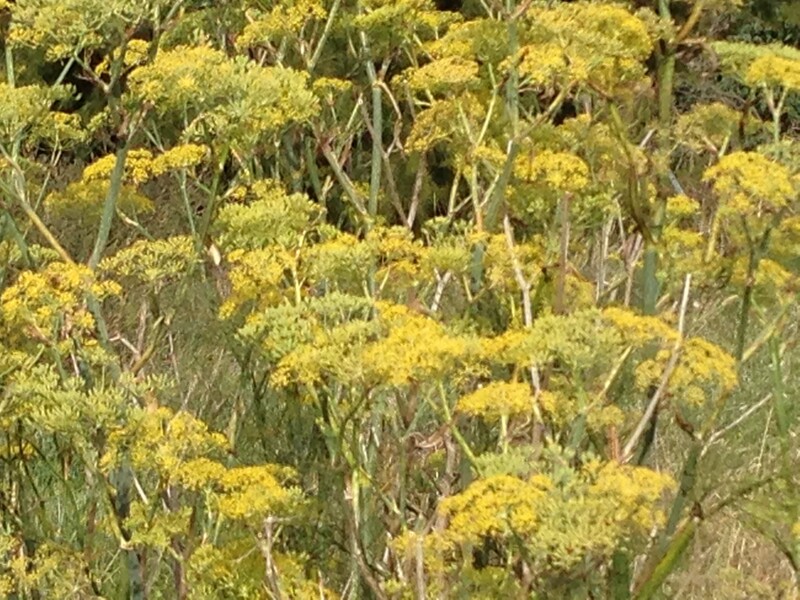 There is plenty of wild fennel growing along the Cavan Road towards Yass, making a show of bright yellow umbels. The umbrella is supposedly useful for protecting other veggies in the garden, as ladybugs and parasitic flies apparently sit and drink nectar when not attacking young pests. I’m happy to give them all the rest and recuperation they want, although I notice that the vegetable umbels are not as attractive to local insects as the native callistemon flowers. 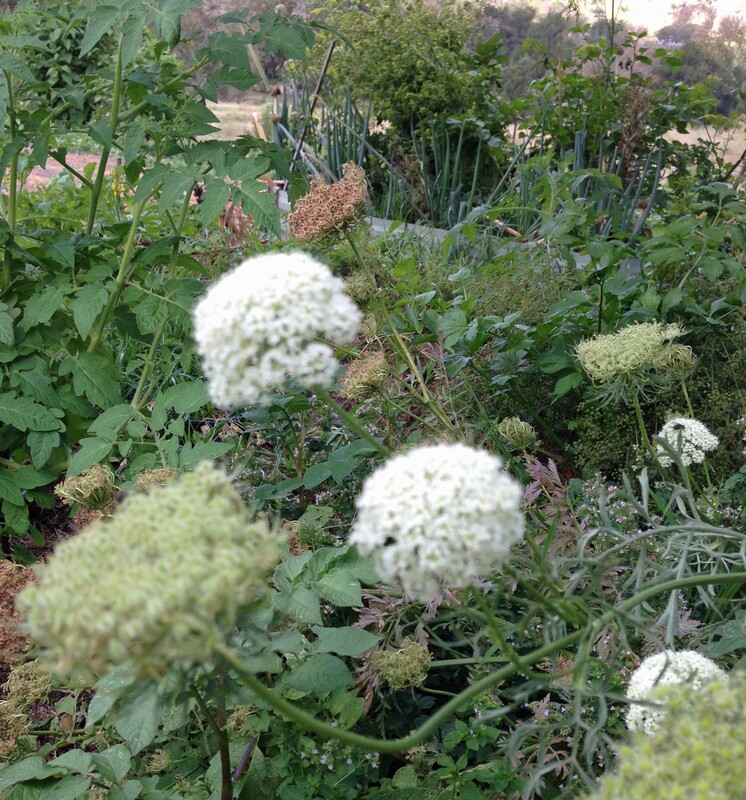 One of the best things about the umbelliferous plants is that so many of them are edible. Except the Blue Devil, probably. I haven’t tried it. Don’t plan to. I’ve got plenty of carrot, celery and parsnip anyway. I often let my plants go to seed as well. Some of the flowers are so pretty so why not and you get the added benefit of natural seeding. I find that I get less insect attack when the garden is nice and messy rather than in ordered rows. Lovely pics and interesting info! Yes, I agree. I’ve definitely seen fewer of the sapsucking harlequin bugs in particular since I’ve had more things going to seed. Slug are still an issue, however. I’ve been slow to make more soap (or beer) traps, which work pretty well but the dogs keep digging them up and carrying them off to chew. The dogs also killed the only blue-tongue to appear in the garden in years. So basically, not helping. Ah, dogs are a problem in the garden. They do like to dig and chew and for some reason are death to blue-tongues. I’m lucky as the only dog here now is an ancient thing not much bigger than a rat and she doesn’t chase anything apart from Indian Mynahs that try to eat her food (which is a bonus!) I’ve noticed a return of two blue-tongues this year so I am hopeful but they aren’t enough to control the tiny snails that sometimes just defoliate herbs overnight. I seem to remember someone telling me of another handy (natural) trick for slugs. If my old brain can remember I will let you know. I do miss the blue tongues. Their blue frightening tactics clearly don’t work on terriers. I have heard that crushed eggshells can deter some slugs, maybe that’s the other tactic you were thinking of? I never seem to have enough shells to be effective, though. I’d be interested to hear. Nice to see you umbrelliferae! I love them too, although I try to dead-head my fennel as it is a bit weedy. I’ve never seen the blue devils before – lovely. I had fun mucking around with some pictures of my gone-to-seed umbrelliferous plants a few months ago… https://berowrabackyard.wordpress.com/2014/11/18/gone-to-seed/ Thanks for posting – I do enjoy your blog. Thanks, yes I think the Blue Devils are pretty. I just found some coming up with their spring foliage right near the house, very confused about the season I think. 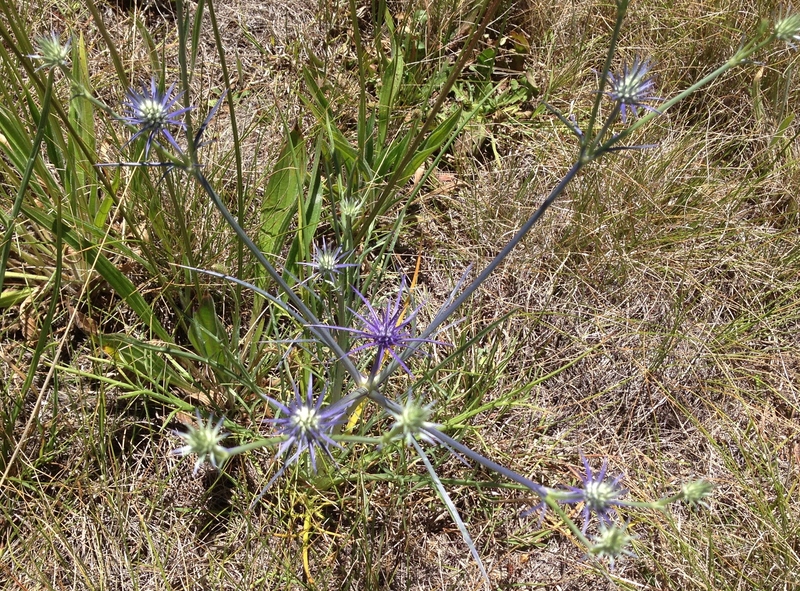 I agree with you about fennel – it’s definitely a weed along the river for about two kilometres. I was a bit disappointed with my photos but I think I was trying to take them in the evening when it was really too dim. Your photos are lovely. Previous WHO STOLE THE CANOPY?